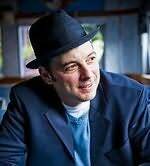 Jonathan Evison is an American writer best known for his debut novel All About Lulu published in 2008, which won critical acclaim, including the Washington State Book Award. In 2009, Evison was awarded a Richard Buckley Fellowship from the Christopher Isherwood Foundation. A second novel, West of Here, will be released in February 2011 from Algonquin. Editor Chuck Adams (Water for Elephants, A Reliable Wife, An Arsonist's Guide to Writers Homes in New England) has called West of Here the best novel he's worked on in over four decades of publishing. "Chock full of big themes and characters who will stick with you long after you set the book down." "...a whip-smart, hilarious, and deeply moving meditation on fatherhood and marriage." "Courageous, powerful, and mercifully refreshing." "A playful, imaginative, and wildly unpredictable ride." "The Hearts of Men is a winning second novel, by turns wistful and wise, sad and funny, eminently readable, and always atmospheric. Without a doubt, Nickolas Butler is a young writer to watch." "A twisty tale that surprises at every turn, Shadow of the Lions will keep you turning pages compulsively into the wee hours, cursing Christopher Swann for the inconvenience." "Kohnstamm delivers a blistering, clear-eyed, and surefooted debut novel about the perils and pitfalls of misdirected ambition. More than that, Lake City is a hilarious and sneakily incisive examination of the cultural tensions, and widening class divides that simmer on the fringes of an increasingly homogenized Seattle?or San Francisco, or Brooklyn, or Los Angeles, or any other American city in the throes of affluenza and gentrification."